Customer Relationship Management (CRM) is one of those critical technologies that companies use to generate additional sales, especially during tough economic times. 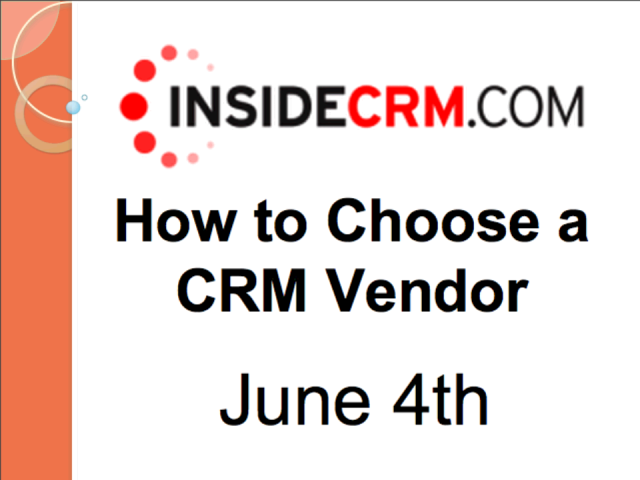 Join us for this exclusive online web seminar to learn how to choose the right CRM Vendor for your business. In a down economy, customers expect more for their hard-earned dollar -- more value, more service and more attention! Those companies that stay current with technology improvements and invest in CRM solutions to better understand and serve their customers will capture greater market share now and have a competitive advantage as the economy bounces back. Join Inside CRM for this live, interactive Web Seminar sponsored by NetProspex, and learn how to make the best purchase decision for CRM technology! Two Dates Available! Select the following date & time that is most convenient for you to join! It's not about college kids anymore. Communication between both B2C and B2B organizations is thriving among social networks. It's changing the way businesses interact with their customers. It's also changing what your consumers expect from you as a business. Some companies have integrated social media into their company culture and business model, and have been hugely successful- some have faced difficulty. In this webcast, we'll show 5 examples of organizations using social media effectively, and a couple of examples of organizations who weren't so successful. Join NetProspex on *Thursday, September 24 at 2pm EST for inspiration from real companies using social media. You Bought a List, Now What? Buying contacts is easy, but turning your contacts into sales is the challenge. Join us today and learn how to get maximum value from your database of business contacts, by leveraging best practices for executing successful outbound campaigns! Registrants of this webinar will be eligible for a free trial account with NetProspex - who believes that bad data is a waste of your time. With a crowdsourced directory of business contacts with over 7 million names, the NetProspex search provides validated business leads. E-space is limited so please sign up now! Everyone knows the real proof that marketing works shows up when prospects and customers buy. The science of quantifying marketing’s contribution to sales wins is still evolving even while your prospects are taking control of how they buy. The web has jumped squarely in between your sales team and your customers, delaying conversations and even eliminating the need for many of the early-stage discussions that used to establish 1-to-1 relationships from the start. This is where lead nurturing, optimized with marketing automation, steps in to help produce prospects with a higher propensity to buy. •	Tune nurturing programs on the fly to produce even more sales opportunities. •	Initiate online dialogues that nudge prospects toward the next buying stage. •	Use auto response emails to let prospects know you’re listening—without scaring them. •	Reduce the effort salespeople must expend to initiate high-value sales conversations. •	Re-engage and restart nurturing for leads not yet ready to buy. Join us with B2B Marketing Strategist Ardath Albee for part 3 in the series of instructional webinars where we’ll help you optimize your nurturing programs to keep sales out selling. Join Focus industry market analysts, in this free live webinar, as they share their insight and expertise on Marketing Automation – one of the fastest-growing software solutions that is revolutionizing how companies sell! We have developed this exclusive webinar from Focus research methodologies and hours of interviews conducted with real-life buyers from agencies to interviews conducted with real buyers representing leading adopters of marketing automation products and services. Get a comprehensive understanding of how Marketing Automation is changing the way companies market and sell their products. Plus, get an easy strategy to overcome the complexities of choosing the right solution for your company. When Does Content Count Most? 5 Steps to Drip Campaign Success. Lead nurturing is credited more and more with improving marketing’s ability to generate sales-ready leads. Transitioning leads to sales opportunities is a challenge often easier said, than done. Marketing automation eases that challenge by enabling the creation of drip campaigns that get the right content to the right prospect at the right time. Relevance is king for your prospects, making your content the critical component that drives nurturing program results. With the answers to questions like these, marketers can launch drip campaigns that improve the health of sales pipelines. •	How can we create enough content with limited resources? •	How targeted does my content need to be? •	What can we learn from the content leads read? •	How do we determine a lead’s buying stage? •	What types of content create the highest levels of engagement? Join us with Felicity Wohltman VP of Marketing for Genius.com and Author and B2B Marketing Strategist Ardath Albee for part two of three in the series of instructional webinars where we’ll give you the framework you need for creating content designed to power successful drip campaigns. Attendees will receive a free how-to guide, to ensure Lead scoring success in the future, and a free trial account for NetProspex, including 100 free leads! NetProspex helps customers maximize their ROI by providing them with higher quality, more accurate sales leads. Customers pool their contacts with NetProspex’s database in exchange for new contacts. A range of proprietary technologies is used to ensure that the customer-supplied data is validated up front and that the quality of the database is maintained over time. Different strategies for headline text, body copy and design can each dramatically change the net response rate for a given email campaign. •	How does personalization impact response rates? •	Do graphics impact results? Buy or trade your own contacts to earn credits to find what you need from a vast user-contributed directory. All traded contacts are validated before being published. Lead scoring has been touted as the new secret sauce that transforms marketing from art to science. The reality is that in B2B selling, it couldn’t be further from the truth. While lead scoring enables marketers to be smarter about nurturing prospects through the pipeline, based on their profile and behavior, the ultimate goal is to effectively determine the exact moment to involve a human (Sales Rep). • How do we create a purposeful lead scoring process? • Which online behaviors indicate higher interest levels? • How can lead scoring help marketing to increase our sales pipeline? • What steps can we take to reduce pipeline clutter? Join us with Genius.com and B2B Marketing Strategist Ardath Albee for part one of this instructional three-part series where we will give you the tools needed to effectively set up and optimize your lead scoring efforts, while avoiding common pitfalls. Need in-depth, accurate contact information? NetProspex is comprised of millions of people, in business to do business. Check out our user-generated database, cleaned and honestly accurate by powerful, unique proprietary technology. Even upload your own contacts to receive a one-for-one equal exchange of new contacts.